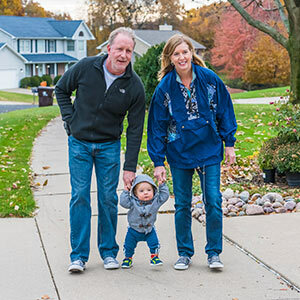 As a registered nurse, Angela Farnan has spent 32 years in the pediatric intensive care unit (PICU) and neonatal intensive care unit (NICU) at OSF HealthCare Children’s Hospital of Illinois where she cares for the smallest and sickest kids. Along with her fellow OSF Mission Partners, she embraces each child as if they’re family. That connection doesn’t end when the kids leave the hospital. While Angela cares for kids dealing with all types of conditions and with varying needs, since 1991 her main focus has been taking care of kids undergoing treatment at the Congenital Heart Center at OSF Children’s Hospital in Peoria. It is the only comprehensive congenital heart program in the state that cares for kids and adults outside of Chicago. “My love is the cardiac kids,” she said. It started with light-hearted bantering while working out at the same gym. One day, Angela told a friend, “I’m going to have his babies someday,” motioning over to where Rick Farnan was working out. “It took him about three months until he finally asked me out. Our first date was going to church,” Angela said. That was 17 years ago. In May, the couple will celebrate their 11th wedding anniversary. Both had been married before, and Rick has an adult son, Bryce. Angela always wanted children and it wasn’t until after she and Rick married when she found out she couldn’t get pregnant. “We both did testing – basically, my eggs weren’t viable for conceiving,” she said. But Angela didn’t dwell on that fate. She had her kids in the PICU. On May 30, 2017, a newborn boy came to the PICU. He’d been born with hypoplastic left heart syndrome (HLHS), a congenital heart defect that was detected in utero. Basically, the heart doesn’t develop the way it should during the first eight weeks of pregnancy. The defect leaves most of the left side of the heart too small and underdeveloped with just one pumping chamber. Dr. Mark Plunkett, a pediatric heart surgeon with the Congenital Heart Center at OSF Children’s Hospital, said the condition requires a series of at least three operations between birth and up to age 4 or 5 to redirect blood flow to the lungs and body with several connections. The first surgery usually happens during the first week of life. If a family is unable to provide the intensive care the baby requires, they stay in the hospital or go into medical foster care. For that newborn boy in the PICU, his surgery took place on June 2, 2017, when he was just three days old. Angela was a member of his care team. His name is Blaze. A feeding issue prolonged Blaze’s hospital stay. His family didn’t live near OSF Children’s Hospital in Peoria and didn’t have the resources or support to provide the intensive care Blaze needed at home. Blaze would require a second surgery around 6 months of age to take the stress off the single ventricle pumping blood throughout his body. Until that surgery, Blaze needed to be cared for in a safe environment. A case worker was involved and was working with an organization that provides medical home stays for those in need. Being familiar with the case and wanting to help out the family, combined with her own expertise, Angela decided she would do what was needed to become a medical foster home for Blaze. She worked with the organization and completed classes and underwent a home visit. By early November 2017, when Blaze was 6 months old, the organization withdrew from the case. “I was a little crushed,” Angela said. This meant Blaze would remain hospitalized until the second surgery. Then on December 13, 2017, Angela got a phone call inquiring if she’d be willing to foster Blaze until his next surgery. If so, she was told it would be without any financial assistance from the state. That wasn’t a concern for Angela. “For me, it was about getting him in a normal environment. We were coming into cold and flu season, and we didn’t want him getting sick,” she said. Of course, Angela had told Rick about Blaze, and he was on board with having short-term guardianship to provide the baby with a safe environment. “People were knocking on the door one after the other,” he said. Angela wasn’t surprised at the outpouring. Blaze, who had been thriving in the PICU and was developing quite the social personality, continued thriving in the Farnan home. “We had him here a couple weeks when we just fell in love with him,” Angela said. And her PICU family was right there with them, volunteering to babysit when Angela had to work. “He has a lot of aunts and uncles,” Angela said, referring to her PICU family. Dr. David Jantzen, a cardiologist with the Congenital Heart Center at OSF Children’s Hospital who diagnosed Blaze’s condition in utero and provides his medical care, wasn’t surprised to see that. During the foster stay, Angela remained in contact with Blaze’s family, updating them on his progress and the upcoming surgery. The day arrived for Blaze’s second surgery with Dr. Plunkett. It was March 20, 2018. Blaze’s parents traveled to Peoria for the surgery. “We sat with the family during the surgery and they started asking questions about how in depth his care would be,” Angela said. She said having Blaze at her home was an eye-opening experience. Following the surgery, the doctors came to speak to the Farnans and the parents. It was then the mother asked the Farnans if they’d consider taking Blaze on a more permanent basis. The Farnans clarified with the parents what a “more permanent basis” meant. Rick said it was a very emotional time – seeing Blaze hooked up to monitors and realizing the inner struggle the parents were experiencing. The couple filed adoption papers on April 14, 2018. The adoption was finalized June 8, 2018. On that day, the courtroom at the Peoria County Courthouse was packed with family, friends and co-workers of Angela and Rick, including Dr. Plunkett. Dr. Jantzen said he’s thankful Angela and Rick were there for Blaze. It’s a true example, he said, of how they approach care at OSF Children’s Hospital. Rick and Angela Farnan along with their son, Blaze. When Blaze is between the age of 3 and 5, he’ll undergo the third surgery in the series. That procedure will further relieve the work and stress on his heart and allow for his oxygen level to normalize, Dr. Plunkett said. From there, his care, as with anyone born with a congenital heart defect, will mean a lot of follow-up doctor visits, tests and monitoring. “Hopefully he won’t need anything else for a really long time,” Dr. Plunkett said. “But the problem is the right heart is doing all the work and it’s not designed to do what it’s doing, so there is potential for heart failure problems down the road. During a recent visit to the Farnan’s home, Blaze, who turns 2 in May, sits atop the kitchen island, scooting around, engaging his dad, Rick, in a game of sword fighting with toddler-sized toothbrushes. His cherubic face breaks into quick smiles. He’s ornery and loves blowing kisses, the outdoors, music, dancing and knocking down blocks. He gobbles a chunk of bread and an oatmeal cookie Rick offers him as Angela looks on. She becomes emotional when asked how it feels to be a mom, to have the baby she hoped to have with Rick. “I honestly haven’t put it into words before,” she said, glancing at Blaze as Rick plays with him in the family room. “I go to bed every night and thank God for the opportunity to be a parent. I pray over him every night. He is truly a blessing. Even coming home from a stressful day at work has changed.